Monthie Mechanical Inc is proud to serve the Paris community! About Paris, KY - Happy to be your hometown Heating & Air Conditioning Contractor! Paris, Kentucky is located in Bourbon County on the Stoner Fork of the Licking River approximately eighteen miles northeast of the city of Lexington. Settled in 1775 by Joseph Houston as Joseph’s Station, the community of Paris was chartered as a city in 1862. Today, the city of Paris serves as the county seat for Bourbon County and is home to a population of approximately 10,000 people. With its agreeable climate that brings seasonal hot summers and mild winters, Paris is a great place to live or visit any time of the year! True to its motto – “Horses, History, & Hospitality” – the town of Paris abounds in just that! Paris is home to several prominent thoroughbred breeding operations, including Claiborne Farms where the immortal Secretariat stood at stud and was later retired and buried. Other thoroughbred operations in the area include Hillcroft Farm, Xalapa Farm, and Denali Stud. History lovers will enjoy visiting the Hopewell Museum, a Beaux Arts structure built in 1909 that served as the first post office to the area and features changing exhibits relative to the history of Bourbon County and Central Kentucky. The city’s downtown historic district features several historic buildings that are listed on the National Register of Historic Places. The Cane Ridge Meeting House, circa 1791, that was one of the sites of the Great Revival of 1801, hosted an estimated 25,000 worshippers over the course of the revival. 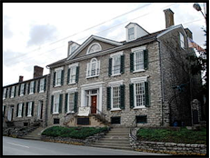 Other historic buildings include the Shinner Building, circa 1891, believed to be the world’s tallest three story structure that is presently home to the Paradise Café, and Duncan Tavern, built in 1788 by Major Joseph Duncan that serves as headquarters for the Kentucky Society of the Daughters of the American Revolution and is home to an extensive genealogical collection.